April 8-12 is Severe Weather Awareness Week. During this week, many municipalities hold mock tornado drills and encourage people to practice their severe weather safety plan. MILWAUKEE — April 8-12 is Severe Weather Awareness Week. During this week, many municipalities hold mock tornado drills and encourage people to practice their severe weather safety plan. Most people know where they would take shelter during a storm. Most likely it would be their home, school or business. 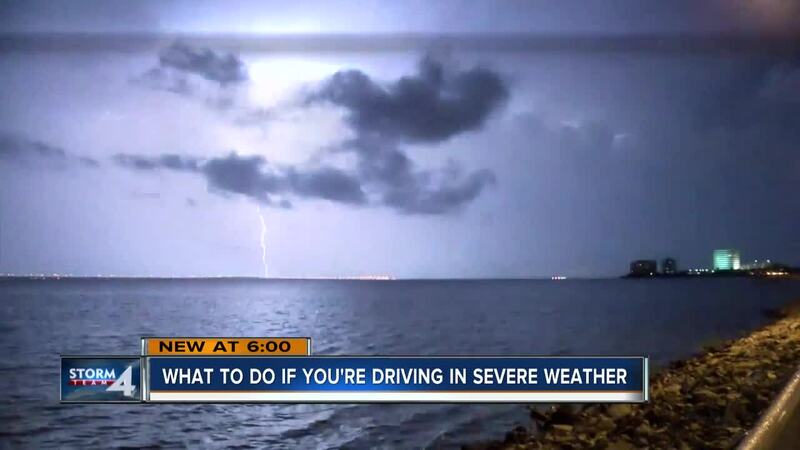 But what should you do if you are on the road when severe weather strikes? In hailstorms, drivers often pull underneath an overpass to wait out the storm. "Can you imagine if a bunch of cars started piling underneath here, and then cars in the traffic lane decided to do the same thing?" Fond du Lac Fire Chief Peter O'Leary said. It's what happened recently in Oklahoma during a large hailstorm. More than 20 vehicles turned the highway into a parking lot and made it extremely dangerous. "If you were underneath here and you get hit because you are parked underneath here, you're going to cause a crash," O'Leary said. "You're going to make a bad situation a whole lot worse, and it makes it harder for other people who do have to get through to get through." The drivers not only blocked traffic but they also blocked emergency responders from getting to people who needed help. O'Leary said if drivers need to pull over he would prefer they form a line along the side of the road instead of a cluster under the overpass. "We have to get down here in an emergency. You can get a new windshield, you can get your car fixed, but we can't get a new you." It isn't just hailstorms. Storm Team 4 Meteorologist Jesse Ritka said that by going up underneath an overpass you're placing yourself in a dangerous wind and debris field, so low is the place to go. "People elevate themselves. They end up going up high because they think this will give me the best shelter. And to the naked eye, yes, but it's also winds that are whipping through that creates an incredible tunnel," O'Leary agreed. Ritka and O'Leary recommend finding a ditch or a low-lying area, lie down on the ground, make yourself as small as possible and cover your head. "Don't look up. Don't look up at all because you could have debris. Some of these signs on the side of the interstate — those things go fast," O'Leary said. The best way to avoid being in that situation in the first place is by knowing the forecast and being aware of the weather. O'Leary recommended apps on a smartphone. "You should have weather apps. You should have them alert you so you know, especially if you are going to be out of town." Ritka recommended downloading the TODAY'S TMJ4 Storm Shield app. It uses storm-based alerts, rather than county-based alerts. It uses a user's exact location, therefore preventing false alarms if someone lives in a part of the county not within the threatened area. The app is free.